Last time I blogged about SSL and host-headers I was convinced it is only possible to host multiple SSL sites on one IP address when using a wildcard certifcate. I think I was right at the time, and now comes along Unified Communications UC SSL Certificates (aka Subject Alternative Name). Same issue as before: host-headers enable you to host several websites on a single IP address. We run into a problem with several SSL certificates on one IP address. The first message a server sends in the SSL handshake contains relevant certificate, the server can only determine which certificate by IP address / port. If there is only one certificate to serve – no need to make a decision! Here we can serve a UC SSL certificate which is accepted by the web browser for multiple domain names. # Some CAs do not yet support subjectAltName in CSRs. 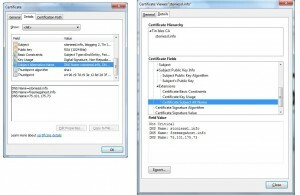 Create a key for the multi domain certificate. Here we are skipping the “create CSR on IIS” step, and creating the key in OpenSSL. 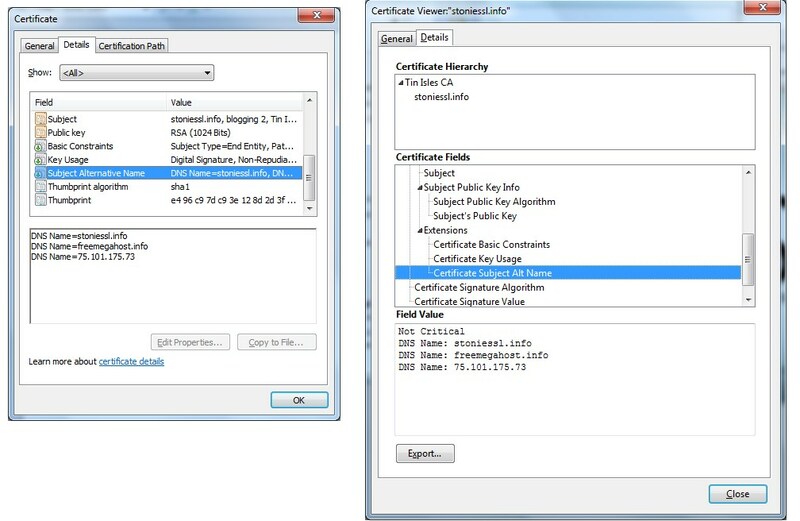 You now have a UC SSL cert you can install on the IIS box. By default IIS won’t allow you to enter a host-header when you are setting the SSL binding. There’s a little trick from this article: Using Host Headers and SLL in IIS 7 – give the certificate a friendly name starting with ‘*’! Posted by russ on Monday, August 2, 2010, at 12:09 pm. Filed under cryptography, networking. Follow any responses to this post with its comments RSS feed. You can post a comment or trackback from your blog. Thanks for writing this up! needed it this week. – Cheers. « Should you trust lastpass.com?